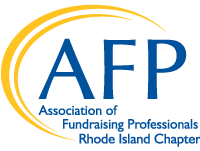 Through the support of the Herbert E. Kaplan Fund at the Rhode Island Foundation, AFP-RI is able to provide full and partial professional development scholarships for Chapter trainings and education workshops. Please download and complete the Professional Development Scholarship application. Submit completed application to the AFP-RI office. To help individuals serving nonprofit organizations develop knowledge and skills in fundraising, the AFP Foundation for Philanthropy sponsors the Chamberlain Scholarship Program. This scholarship covers the conference registration with the exception of a $10 processing fee for the AFP International Conference on Fundraising. AFP-RI will provide reimbursement for travel, lodging and meals (up to $1,000). Recipients are responsible for registering for the conference and making all travel and lodging arrangements and upon return, submitting all receipts to the Rhode Island Chapter. Applications for the Chamberlain Scholarship are available in the fall to attend the annual AFP International Conference on Fundraising in the spring. If you have questions, please contact the AFP-RI Office.